A copy of this memo is attached, below. I have reviewed the video and the PowerPoint that was presented to the RTC. Much of what he said was incomplete.Some information was inconsistent with data on SMART in the National Transit Database or in its own financial reports. My goal is to provide the RTC with this information so that it will understand that SMART is not the success touted by SMART’s Chairperson and General Manager. Hopefully, after reading this memo, the Commission will learn that implementation of passenger rail service “within suburbia” (in that passenger rail wouldn’t serve a major employment center) comes at great cost to the taxpayers and carries relatively few transit passengers.As I demonstrate below, SMART’s ridership is paltry compared with rail transit systems that do serve major metropolitan areas. Indeed, to the extent the Commission views SMART as a “model”, I urge the Commission to careful study of what has actually transpired in the past 10 years in Marin and Sonoma counties, as opposed to what the General Manager claims has transpired. In his presentation, Mr. Mansourian stated ridership to date was 650,000. 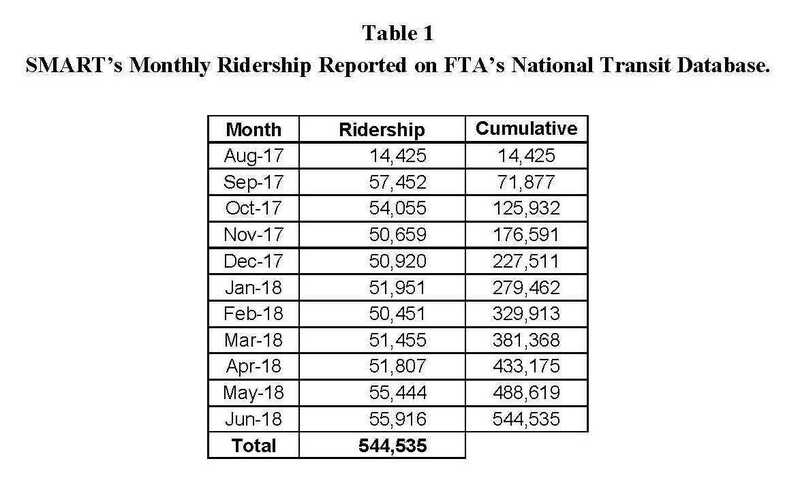 (1) According to the published monthly data in the National Transit Database (through June) as shown on Table 1 (next page), total ridership from August 25, 2017 through June 30, 2018 was 544,535. If so, in the month of July, SMART’s ridership would have had to exceed 100,000 for the 650,000 figure to be accurate. SMART’s Annual Report issued in December 2017stated that “In 2017, SMART carried a total of 252,295 passengers (2), with a daily average of 2,191 on weekdays and 1,393 on weekends.” Simple math indicates that monthly ridership from January – July 2018 would need to average 56,814 riders for the total ridership he claimed.The Commission ought to seek an official explanation for this difference. According to Caltrans Ramp Volume reports (5), there are at least 1.5 million vehicle trips on Hwy 101 between Airport Blvd (near SMART’s northern terminus) and Sir Francis Drake Blvd (SMART’s southern terminus after completing the Larkspur extension). (6) Even if ridership increases to its forecast of 3,000 riders per weekday and all of the riders were former vehicle users, ridership on the train represents only 0.2% of the vehicle trips. In addition, the train operates in two directions.With 2,400 riders per weekday in June and about half of them traveling south in the morning commute, this represents only a small percentage of vehicles from the traffic flow.Mr. Mansourian stated that SMART has not impacted peak hour commute traffic and this is one of the key reasons. There are two comparisons to consider in order to interpret the ridership reported in Table 1. The first comparison is from data online in the National Transit Database which reports ridership by month. 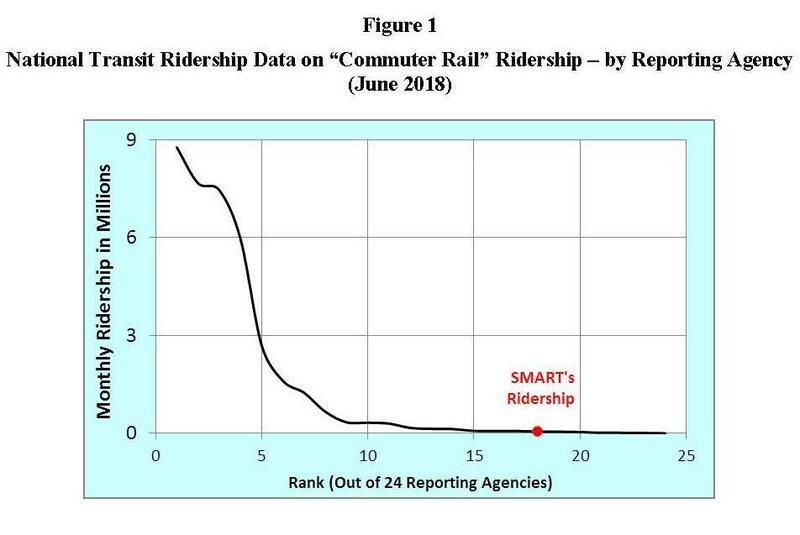 There were 24 “commuter rail” transit agencies that reported ridership for June 2018 displayed and these data are the basis for the graph in figure 1. SMART’s ridership is ranked 18th in size as measured by ridership and is indicated with the red marker. It’s ridership for June is only a small proportion of the larger transit agencies. The population of Marin and Sonoma counties (2015) was 763,000 people.To the extent ridership is positively related to the population serviced, a “back of the envelope” calculation would lead to a round number of 1,200 riders per day for Santa Cruz County, based on the Santa Cruz County population. (7) This number may be considerably smaller if the trains only operate in a single direction or with frequencies longer than SMART’s. Table 3 provides a summary of SMART expenditures since its legal inception through the end of fiscal year 2017. Data is from the audited financial reports available on line. (9) While the question wasn’t asked, as indicated in the table over $650 million of public funds have been spent. (10) The table also reports sales tax revenues for reference. 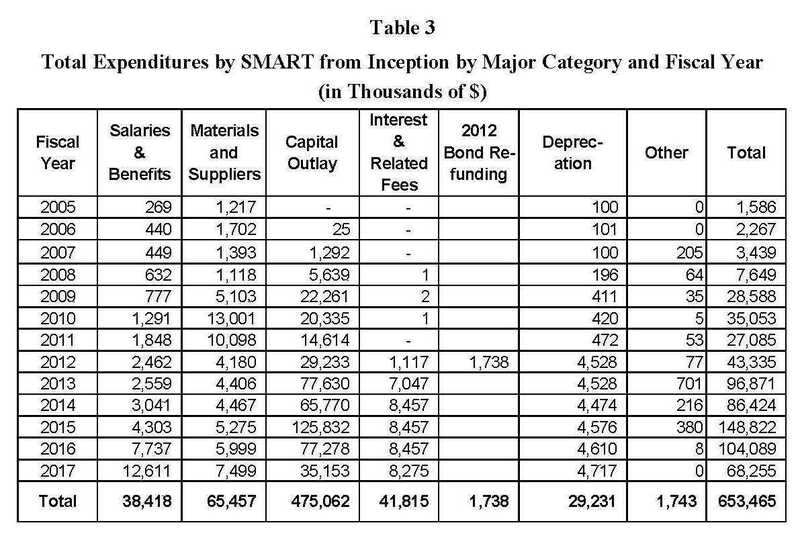 However, to understand “how much of SMART has been funded with local dollars” one needs to account for $199 MM construction bond issued in early 2012. A relevant question commissioners should be asking is the extent to which these expenditures can be scaled to the length of the line proposed in Santa Cruz County. (11) Also, much of the actual cost of construction to local taxpayers will depend on a key decision: whether the RTC opts to seek federal funding for construction of the line or, alternatively, seeks to self-fund construction, paid by issuing a bond, as SMART did (see discussion below). What has been SMART’ s Source of Revenues? Distribution of marketing materials promoting the train to every household in two counties. In the long run SMART’s financial position is at best “precarious,” because it has committed large proportions of its current and future tax revenues to debt service..
Table 5 reports the agency’s projection (13) of debt service and its assumed constant growth sales tax revenue path after FY 2018. 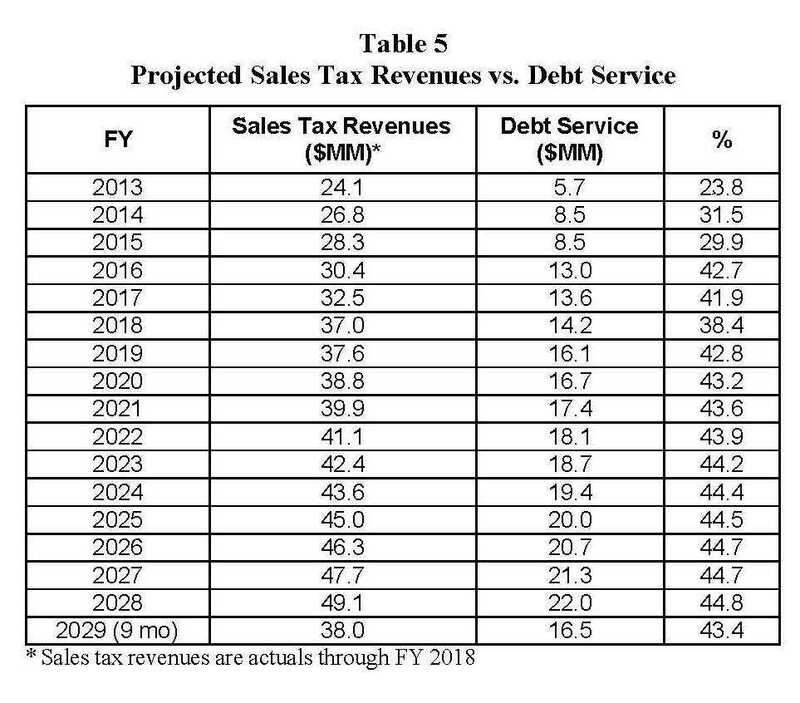 As indicated, the agency’s plan is that debt service payments will rise faster than sales tax revenues. This means SMART expects its “leverage ratio” to increase from its current 38.4% to 44.8% over the next several years, exposing the agency to recessions and the double-impact leverage has on SMART’s ability to fully subsidize rail operations. It also means over time the tax revenues available to subsidize rail operations become more sensitive to the growth in sales tax revenues. Because debt service payments the Board committed to are “senior” to the rest of SMART’s expenditures and are scheduled to increase, when a recession occurs and sales tax revenues decline, the impact on what’s left over is multiplied. For example, 5% decline in sales tax revenue in this year would reduce sales tax revenues available for rail services by 13%. Fare revenues will also fall when unemployment increases leading to even more declines in revenues. Meanwhile debt service commitments are scheduled to rise. In other words, transit agencies with a combination of a material debt service payments and reliance on sales tax revenue are exposed to a “leveraged” financial impact in a recession. Based on the FTA’s internal review (and not the claims of local rail proponents) the FTA expected low ridership and was well aware of the many costs associated with constructing a rail line. At the same time, they warned that the federal “New Starts” program that funds new rail construction in the U.S. is highly competitive.SMART representatives were told of the low probabilities of receiving federal funding and the length of time it might take to obtain it. (14) As a consequence, the Board opted to self-finance construction of the rail line. The issue they then faced was they were told by their consultant (Parsons-Brinckerhoff) and many others (including me) that a quarter cent sales tax would not raise sufficient revenues to pay for construction of a 70 mile rail line and subsidize rail operations.Polls at the time indicated the agency couldn’t pass a ½ cent measure and so they opted to proceed with a quarter cent measure. 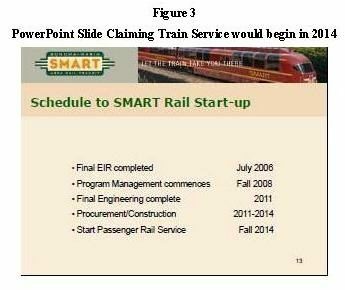 SMART’s General Manager made statements at the Commission meeting15that the decline in sales tax revenues associated with the Great Recession are the reason SMART could not fulfill its promise to voters to construct a 70 mile rail line. Second, pointing to the decline in sales taxes ignores the “other side” of SMART’s balance sheet, namely debt service.Interest rates and associated debt service was a significant component of SMART’s financial plan provided to the public prior to 2008 (see table 5 above).But interest rates declined significantly between 2008 when the original funding plan was prepared and 2012 when the bonds were issues. The decline in interest rates saved SMART millions of dollars of debt service which the General Manager has failed to mention…ever. Third, the Great Recession had significant impacts on wages of construction workers, during the period that SMART has never accounted for.Indeed, given the project entailed far more costs than envisioned, which is common when government agencies forecast capital construction projects16, it would be quite difficult to assess just how much difference this made. Fourth, to believe the General Manager’s claim, one would have to also believe in the conclusions provided in SMART’s original Expenditure Plan (adopted in July 2008). Rather than a real analysis of future costs, sales tax revenue potential and associated risks, the Expenditure Plan was a political document, otherwise known as “an answer in search of a question.”Its goal was political:to claim a quarter cent sales tax was sufficient to finance construction and rail operations.It did this by overstating potential sales tax revenue growth and significantly understating the cost of constructing a 70 mile rail line. One of the widely used measures of cost effectiveness is the farebox recovery ratio. Another is the dollar subsidy per passenger trip.Both can be computed from available data.Table 6 provides data on these calculations for SMART. 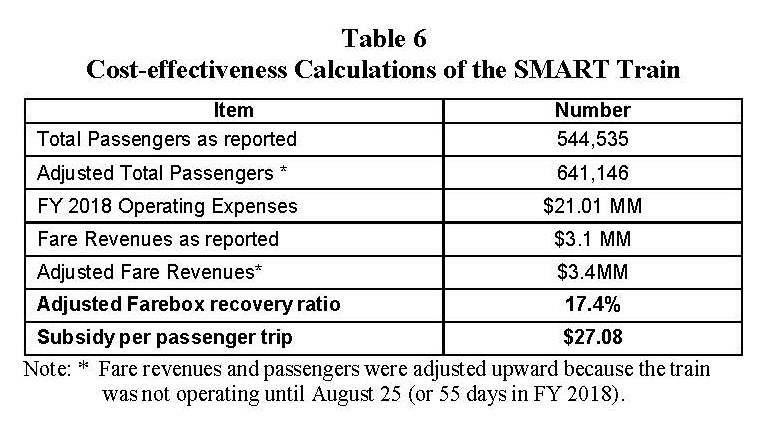 As indicted, SMART’s calculated subsidy per passenger trip exceeds $27.08. By contrast, the NTD data indicates Santa Cruz Metropolitan buses subsidize each passenger trip by $4.94. 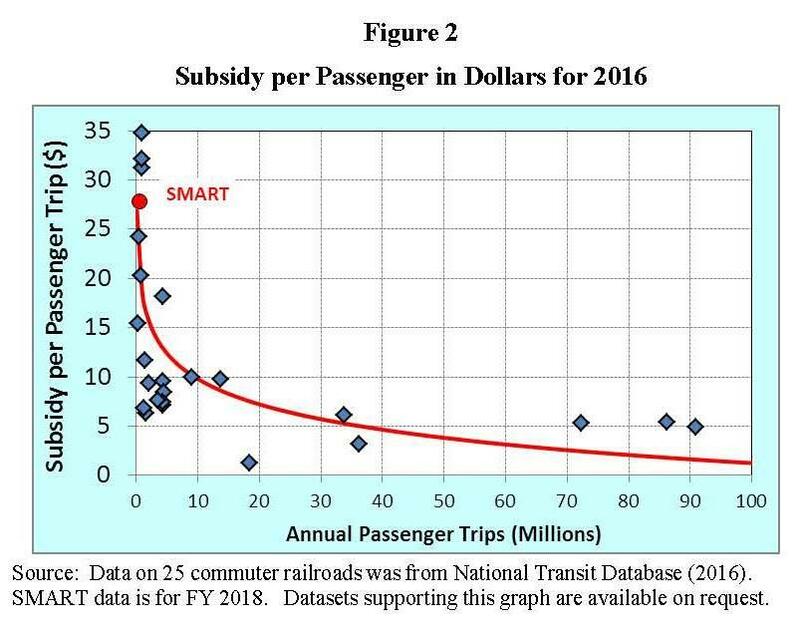 In figure 2, the dollar subsidy per passenger trip for 25 commuter railroads in the U.S.(18) is plotted along with SMART’s figure (in red). The 26 points were fitted with a logarithmic function to illustrate the relationship between the number of passengers traveling on a system and the cost to taxpayers to subsidize each trip. As indicated, because rail systems have high fixed costs, those systems that generate more passengers will spread those costs over more passenger trips. The Commission ought to use this metric for the proposed passenger system in the county as it is a widely used, easy to calculate, and provides the public with relevant information on a rail system’s cost-effectiveness. SMART is a single track system with four passing tracks. In such a system delays of one train on the system can be easily be transmitted forward and backward from the point of delay.In addition, it can limit the number of trainsets that can operate because the sequencing of trains north and south must be relatively exact in order to avoid a collision. One of the important consequences on this system is how it limits the frequency of trains, which can be observed by scrutinizing the schedule (see the weekday schedule in Table 7). As indicated, schedule indicates 12 trains a day depart either 60, 90, and 180 minutes after the prior train’s departure with 90 minute gaps during the peak commute hours being the most notable. SMART has claimed the cost of housing is keeping it from hiring train operators.In fact, this is an indication of the financial constraints facing the agency. The General Manager touted “public transit agency coordination. ”For sure there have been many efforts to provide bus services that “meet the trains”, but full coordination is extremely expensive and simply not doable. Golden Gate Transit publishes a SMART-Golden Gate Transit connection which applies only to the San Rafael station, where there exists reasonable connectivity to support the claim by the General Manager. Neither the Hamilton station nor the Atherton stations are directly served by a Marin County Transit bus. (20) By contrast, Petaluma has several buses serving between Sonoma County Transit and Petaluma Transit, but it is far from every train. It sure sounds trivial. It isn’t. 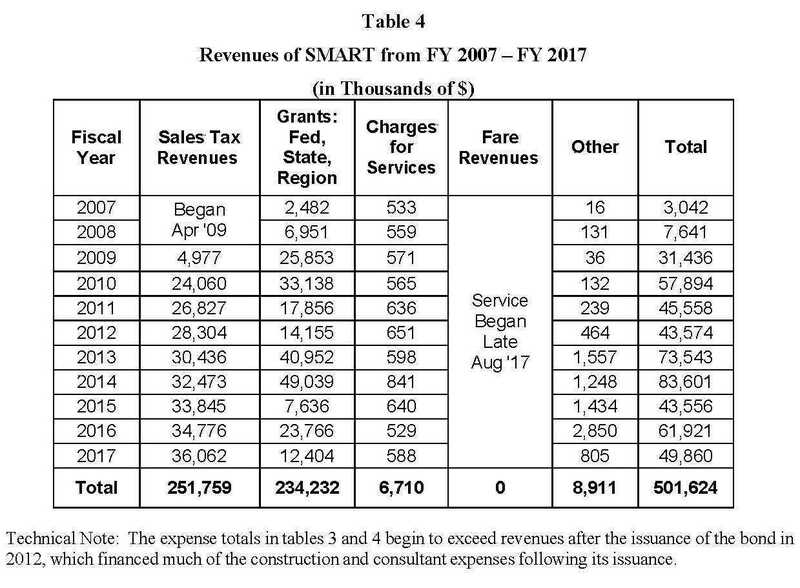 According to SMART it received $37 million in sales tax revenues if FY 2018. The California Dept. of Finance estimates 291,267 occupied housing units in the two counties. In other words, in FY 2018, the average household paid $123 in taxes to support the train. Figure 3 shows a PowerPoint slide presented at a 2008 SMART Board meeting by the then General Manager Lillian Hames that was also part of the campaign literature distributed to every household in two counties. While the General Manager continues to claim the delays in implementation were a direct consequence of the Great Recession, I have attempted to demonstrate that this claim is a convenient political argument but not grounded in any analysis of this question. At the same time a significant policy issue for the Commission to consider: Marin and Sonoma county taxpayers paid sales taxes beginning in April 2009 and continued to pay them for 8 ½ years without receiving any rail services from the agency. (1) In the local media recently, SMART staff has stated there have been 700,000 riders. (2) This is a small difference with the reported NTD cumulative number reported on the table. (3) This is consistent with ridership patterns on Caltrain which reports riders by train. (4) The General Manager has explained that he is currently using train crews to conduct the counts by train. (6) The counts are available on line and were largely for 2013. (7) I assumed 3,000 riders per day on SMART and applied the ratio to Santa Cruz County population. (8) “Master Response H” in the EIR’s Chapter 3: Comments and Responses on Draft EIR. (9) A few were obtained by request from the Sonoma County Finance Dept. (10) The table will be updated for FY 2017-18 when the financial audit report is made in December. (11) Many, but certainly not all, costs of initial reconstruction of a rail line (e.g., permit applications) are independent of the length of the row to be constructed. (12) 43 miles of rail line have been constructed. (13) Data through FY 2018 are actuals. FY 2019 and beyond are specified in its 2014 Strategic Plan. (14) One of these costs is completing federal environmental assessments. SMART didn’t complete this process until long after Measure Q was passed. (15) This is not a new claim. He’s been saying it for years. (16) See for example, Don Pickrell, “Urban Rail Projects: Forecast Versus Actual Ridership and Cost” Prepared for Office of Grants Management, U.S. Dept. of Transportation (October 1990); Nasirui. Dantata, Ali Touran, and Donald Schneck “Trends in U.S. Rail Transit Project Cost Overrun,” TRB 2006 Annual Meeting (2006); or FTAOffice of Planning and Environment, “The Predicted and Actual Impacts of New Starts Projects – 2007 – Capital Cost and Ridership” (April 2008). (17) Calculated as follows: Materials + Capital Outlays was $540 million and they built 61% of the rail line. (18) Calculated from data in the NTD. (19) The private sector is able to fill open positions despite the shortage of housing. Hence, this is really a statement that SMART can’t afford to hire experienced train operators. (20) There is a shuttle within the Hamilton development but not a connecting bus to take you from the SMART station to Ignacio, without a long walk and long wait. Michael Arnold is a practicing PhD economist, former lecturer at the University of California (Berkeley) Dept. of Economics and am currently lecturing in the Osher Life Long Learning Institute at Dominican University (San Rafael) and Sonoma State University (Rohnert Park). Next year I will also be lecturing in the Fromm Institute (University of San Francisco). In 2006 and 2008 he was Co-Chair of the campaign to defeat Measure R (2006) and Measure Q (2008) that provided a quarter cent sales tax in the combined Marin and Sonoma county SMART district.